Firstly, I've submitted this as a thread without any text. My bad. Now that's out of the way, I can now go in and boast about this new(ish) piece of technology we're going to be rolling out for our gaming and mapping routines for Fight or Flight. We haven't yet fully laid out the mechanics behind the game, or details as to whether it'll be turn-based RPG or live 2D action. All we know is here is the basis for some of the more complicated map and traversal logic in the system. The second thing I want to boast about is the N value. You can see where I'm standing with the big "ME :D" icon, and non-playable characters are marked as black squares with NPC on them. N is the smallest number of squares that the player has to move through (only moving horizontally and vertically i.e. one diagonal square counts as two) to reach that square from the current standing position. It may not seem like a huge thing, but mark my words this sort of pathfinding algorithm is quite easy to say "do" but a lot harder to say "program"! To that end, note the second NPC standing in the east. Not the square to the east of the second NPC that says "n=13". 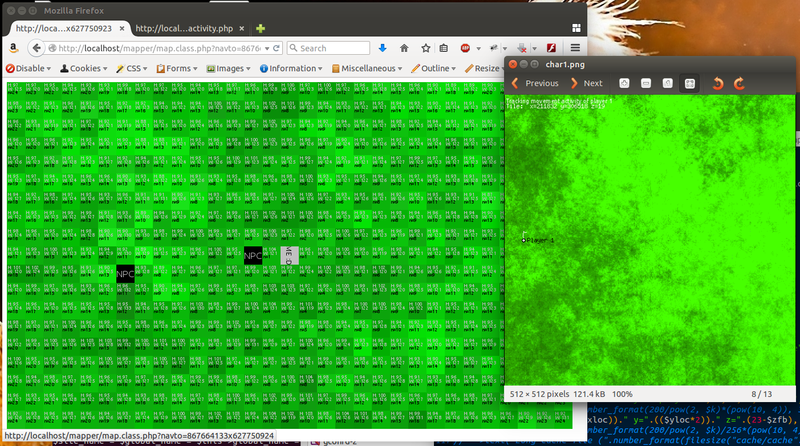 To get to that square, our software has done compound pathfinding. Which is nothing short of a miracle. Just thought I'd share our progress. Maybe this is something we'll see released in 2015! !